Last posting here was made after my first book came out, Triumph & Hope: Golden Years with the Peace Corps in Honduras, which continues to attract readers, even though Peace Corps left Honduras for security reasons. I’m a firm believer in walking the walk, not just writing about it. I still travel annually to Honduras to volunteer with medical brigades and other humanitarian projects (last time, in Feb. 2016), partially supported by sales of that book. I continue to promote Peace Corps service for folks over 50 in my public talks. 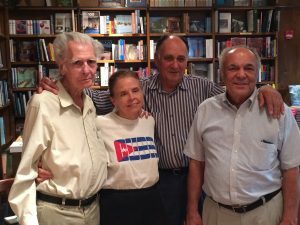 Then in 2014, I published my second book, another memoir, Confessions of a Secret Latina: How I Fell Out of Love with Castro & In Love with the Cuban People. While that book was released before President Obama’s historic outreach to the Cuban leadership, it foreshadows it, offering a rare intimate view of Cuba—and of Latin America—by an outsider fully immersed due to cultural familiarity and language fluency (I work as a Spanish interpreter). I am also privileged to have been a volunteer human rights activist with responsibility for Cuba and other Caribbean countries for 35 years. The designee for that second book’s proceeds is a blind Cuban human rights lawyer, a big challenge, since I am no longer allowed to travel to Cuba myself. (That book has also reportedly been confiscated by authorities at the Havana airport.) I’ve given numerous talks about both books at bookstores, libraries, and other forums. I also write for the Huffington Post and another blog, Democracia Participativa, as well as on my own personal blog. I write whenever I feel inspired and have something to say that I’m eager to share with the wider world. My own life inspires me to write about what I have learned and am always learning. If I were writing fiction, I’d let my imagination take over, and I do have a couple of novels whirling around in my head, but nothing yet on paper. For non-fiction and journalism, which have kept me pretty busy, I’m a stickler for facts. Sometimes documenting those facts gets tedious, but non-fiction appeals to me both as a reader and a writer because it reflects the real world. And often the old cliché about truth being stranger than fiction is right-on. I never prepare in advance; I just write and revise later. First, explore a topic that really interests you. Then, put yourself in the reader’s place—would this subject be informative and compelling to an uninitiated reader—something that someone else might want to know? It’s not enough for writers to express themselves or to want to delve into a topic—would anyone else care about it? Writing is a form of communication, after all, not just private pastime. With my first book about Peace Corps in Honduras, I queried several literary agents, as having a commercial publisher adds to a book’s credibility. But I balked at their advice: “Don’t mention your son’s death, a real downer in a Peace Corps book;” “Don’t switch between past and present tenses;” and, worst of all, “No photos–publishers won’t deal with photos unless you’re celebrity.” That last was the clincher. Why should I put the future of my book and a percentage of any profits into the hands of someone whose advice I did not value? Both my books have lots of my photos supporting the narrative, including photos of historical significance. So try first with a publisher, but know that self-publishing is always an option. What do you see as the future of publishing? While commercial publishing will continue, especially for celebrity memoirs, academic and medical treatises, and the occasional blockbuster fiction book, the future is in self-publishing and e-books produced under greater author control with more direct communication between authors and readers.